Shoulda, Coulda, Woulda…as we all know…yes, it’s true, we shouldn’t beat the proverbial dead horse but I’m going to do it anyway…the 2012 Great Ski Race was not. This was both a historic event in TNSAR history (the race had only been cancelled once before) and a hysteric event in TNSAR history. Hackles were raised, lines were drawn in the snow, tempers were blown , fingers slowly curled into fists (some of us were ready to go the mat, others were sharpening their pencils and placing bets), but ultimately tears were shed and we all had a big group hug and called the race off. Then it snowed. Lordy, lordy. What’s his name, Murphy, was having a ball with us. Should we have held the race? Maybe. Could we have held the race? Maybe. Would we do it differently if we had x-ray vision into the future? Maybe. Nothing like a rock solid, definitive maybe. At the end of the spirited debate, we took a collective look in the TNSAR mirror and saw a familiar, tightly knit group of extremely dedicated, extremely passionate, extremely talented people who love this Team and love what this Team does for our community and the community of folks who come visit our backyards. Yes, surprising though it may be, we’re all still friends. 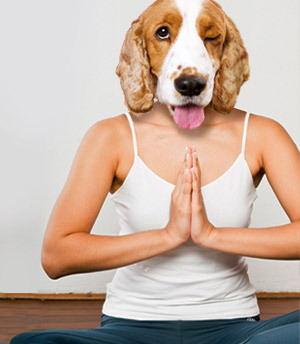 Cheers everybody…ah jeez, where’s the Kleenex... Another hug? 2012 NGSRHCTSS1…On the heels of our cathartic GSR decision making, Tahoe Cross Country held the first annual NGSRHCTSS1. It was awesome, a lot of fun with great weather, great snow conditions, and a tremendous turn out from our local ski community. Oh, yeah, the acronym is Non Great Ski Race Hill Climb To Soup Station 1. Hopefully this was the first and last event. Searches…once again, business has been good, TNSAR pagers have been waking us up at all hours, and search packs are now well stocked with expired cliff bars and left over GU from the Great Ski Race. I’ll try to sum them up as best I can: March 1st TNSAR responded to a callout for an avalanche in Ward Canyon. Preliminary reports from the responding party (RP) described a fairly large slide near Stanford Rock that buried one skier. The previous storm cycle had blanketed the area with 2-4 feet of fresh snow. The Sierra Avalanche Center had posted Considerable avalanche danger throughout the area. The buried victim was reportedly dug out by his two buddies, one of which stayed with the victim while the other skied out to search for cell service and call 911. 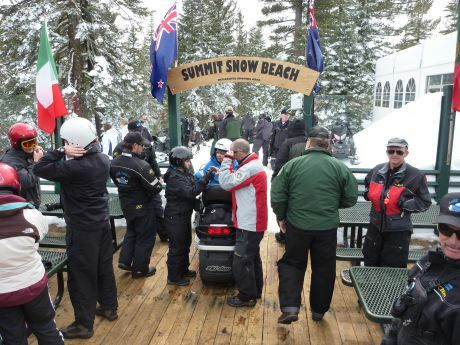 Skiers, snowmobilers, and the Team Snocat responded to the call and met in Ward Canyon. In response to the RP’s report that the victim was conscious but had suffered several injuries including a possible broken leg and possible shoulder dislocation, paramedics from North Tahoe Fire also assembled at the trailhead to lead with definitive care for the victim. The RP led the skiers up to the victim while the snowmobiles and snocat tried to ascend the slopes from another nearby location. After numerous failed attempts to ascend to the victim’s location, the snocat and snowmobiles staged a backboard, paramedic and emergency gear as close to the victim’s location as possible and waited for the skiers to transport the victim down to the waiting snocat. The skiers quickly located the slide and the victim but what they were expecting to see and what they actually saw was shocking to say the least. The slide was considerable, measuring 485 feet wide by 1235 feet long with a three foot crown. Conditions for the searchers were at the far upper end of the sketchy scale. The victim was more buried than dug out, barely conscious, had suffered massive head injuries and bodily trauma in addition to bilateral compound fractures of both legs. The scene quickly changed from a relatively straight forward extrication to complex advanced life support for a victim with multiple grave injuries. After serious digging and packaging, the victim was transported to the snocat and advanced life support care was transferred to the awaiting paramedic. Despite heroic efforts from TNSAR, North Lake Tahoe Fire personnel, and emergency room doctors and nurses at Tahoe Forest Hospital, the victim succumbed to his injuries. He was a local, he was a kid (relative to most of us), and he is dead. This was a tough search indeed. Fatalities are always tough for searchers. Always. This particular one was no exception, and the same questions haunt many of us: why did they go where they did, on that particular day, with those particular snow conditions? Why did this young man choose to drop in to that slope with such known avalanche hazards? He was an experienced skier with avalanche training under his belt. And it was no secret that the snowpack was unstable. Why did he risk and lose his life for two or three turns in the powder? These questions are unfathomable and will forever remain unanswered, but it shouldn’t stop us from asking them and searching for answers. What’s driving this “go for it” attitude? How come the community is not doing more to warn these kids that there are severe consequences for the “go big or go home” mentality? How come the extreme sports industry at large doesn’t endorse a “go big but go safe” motto? How many more of our local kids will we lose to completely avoidable accidents? Ponder that, Grasshopper, and don’t forget to hug your kids, smile and wave at your neighbor, pull over for the SOB who is tailgating you on the way to Squaw, and never ever forget to cherish every day folks. March 18th, TNSAR responded to a callout for two “lost” skiers off the back side of Sugarbowl. Skiers, snowmobilers, and the Team snocat responded to the call and met at the Coldstream trailhead. According to the RP, the two skiers had skied off the backside of Mt. Judah intending to ski left and down to the Lake Run but accidentally skied off right and were somewhere near “Horseshoe Canyon.” According to Sugarbowl Ski Patrol, earlier in the day, around 1:30pm the pair had limited cell phone contact with Ski Patrol but refused assistance believing that they could self rescue. By 4pm the pair were legitimately lost and definitely in need of assistance. Initially search teams deployed from Cold Stream but with deep snow, a snocat malfunction (temperamental fuel pump), and snowmobiles Meyered in waist deep snow, the search teams retreated back to the trailhead and redeployed from the top of Mt. Judah around midnight. After hours of wandering throughout Emigrant Canyon, skiers located the missing pair’s tracks and followed them to a small snow cave where the two missing men were holed up and awaiting day light. The missing duo were very cold and wet but in high spirits and after being force-fed Clif bars and GU, everyone returned to the trailhead as the sun rose in the eastern sky. 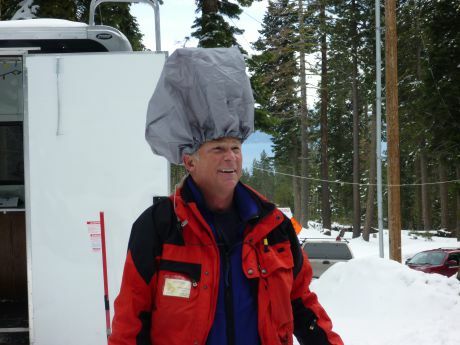 A few hours later, on March 19th, TNSAR pagers rang out for a missing snowboarder off the backside of Alpine Meadows. According to Alpine Ski Patrol, the missing man had skied off the top of Summit chair looking to loop south back into the ski resort but had “accidentally” gotten off course and skied west down the backside of the Sierra Crest. Allegedly, the snowboarder’s tracks down the backside of the mountain distinctly followed the fall line and just so happened to be in fresh untracked snow. Slightly off course. Presumably the “lost” guy was exhausted after so much meandering off course and Placer County decided to send a helicopter out to retrieve the poor guy. TNSAR skiers were staged at Alpine Meadows, boots and beacons on, but were not deployed. 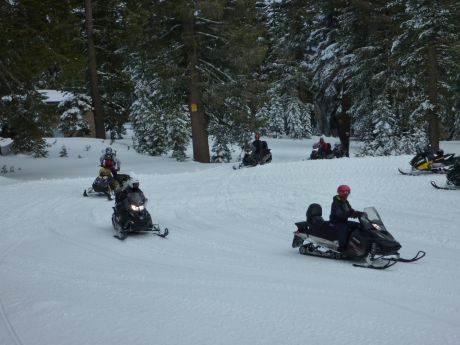 A few days later, March 24th, TNSAR snowmobiles and snocat were called out for assistance with a snowmobile accident on the Fiberboard Freeway near Watson Lake. 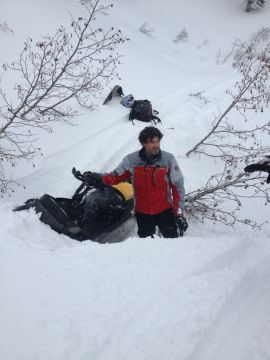 According to the RP, the group were cruising down the well packed trail when the injured snowmobiler accidentally veered off the track and crashed into a tree. When CHP, North Lake Tahoe Fire personnel, paramedics, and TNSAR snowmobilers arrived on the scene it was immediately clear that the accident was fatal. The victim had severe head injuries in spite of the fact that he was wearing a helmet. It was never determined (as of the writing of this sentence) how exactly the accident occurred or how fast the man was traveling when he hit the tree. Unfortunately, even a relatively slow, 25 mph collision can be fatal. Ultimately the victim was transported out to HWY 267 in the Fire Department rescue sled. 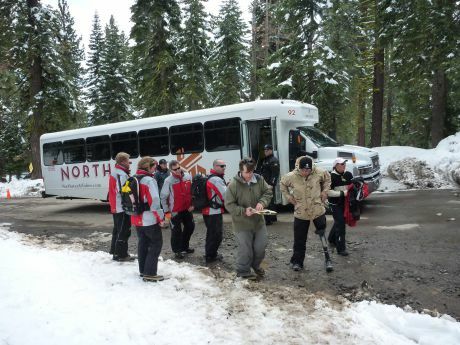 March 26th, TNSAR responded to a midnight callout for a group of skiers who had gone missing during a trip from Donner Summit to Squaw Valley. Other than a 4pm text message from the RP, TNSAR had very little information about the missing group. The text message merely stated that the group would be late getting to Squaw. TNSAR skiers were transported to the top of Granite Chief and then skied north along the ridge, dropping down into the Mountain Meadow Lake area hoping to either intersect the missing party or locate their tracks. A few hours later the RP received another text message saying that the group was heading back to Donner Summit. TNSAR skiers were rewarded for their efforts by a groomer ride to the top of the Shirley Lake chairlift and then skied 4 inches of fresh powder over a freshly groomed Mountain Run to the bottom of Squaw. Last but not least, on March 29th, TNSAR responded to a callout for a lost snowboarder in route from the Bradley Hut to Squaw Valley. 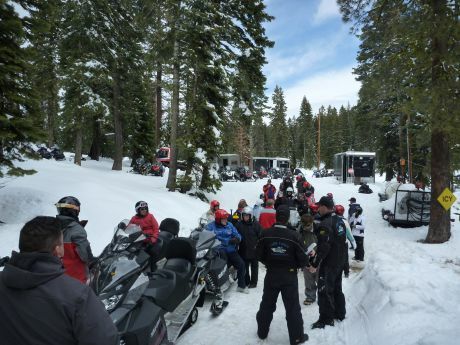 According to information from Placer County Sheriff’s personnel, the missing man left the Bradley Hut at 8:30am (he was supposed to be at work at Starbucks in Squaw at 1pm) but called work at 1:30pm saying that he was lost, had broken a ski pole and one side of his split board and, unfortunately, would be late for work. At around 5pm, two TNSAR skiers, dropped at Granite Chief by Squaw groomers, skied north toward Mountain Meadow Lake, while five TNSAR snowmobilers and two TNSAR skiers headed up Pole Creek to the Bradley Hut to search southward along the Sierra Crest. The general plan was for both teams to search for a young man with a Starbucks ball cap leaving a unique track with one ski mark, one pole plant mark, and one post-hole boot mark. Eventually, Placer County Sheriff’s sleuths found the young man at his friend’s residence in Squaw Valley. At this point it is unclear whether or not the fellow is still a Starbucks employee. All TNSAR search teams were back at the trailhead by 7pm. 2012 TNSAR Executive Primaries…if you don’t already have your campaign posters placed all over town in high traffic, strategic locations then you’re late. But not too late. The 2012 TNSAR Executive Primary season is in full swing. Full swing. Super PACs are spending campaign funds like Imelda Marcos logged in at Zappos. It’s not just impressive folks, it is truly awe inspiring. Freshly groomed, teeth whitened, spray on tanned TNSAR candidates for President, Vice President, Secretary and two Board positions are going door to door, holding townhall meetings, showing up to play bingo at the old folks’ homes, even going so far as to kiss fellow TNSAR members with the ulterior motive of securing support. Frankly, I find it disgusting and I wasn’t even the one unfortunate fellow who was the recipient of that kiss. Well don’t let these acts deter you from throwing your own name into the elections hat. This is it, this is YOUR time, YOUR turn, to make a difference. Full rudder, port side (or starboard, if you're a democrat) get this sinking ship back on course. Don’t be like that wayward snowboarder referenced above; don’t get sucked under the ropes and head out of bounds. Run for office. Change history. I’m serious! 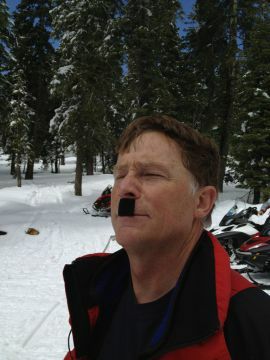 Proof Positive…we all know that snowmobilers are cognitively impaired and intellectually challenged. Modern science has already confirmed that. But did you also know that snowmobilers are genuinely evil? Their leader is constantly in disguise and always on the run. Some posit that he is armed as well as dangerous. Either way this is a serious situation, and conc rete proof of their unequivocal evilness came a few days ago as four of them (there were actually five but one was incognito and on a covert newsletter assignment) helped lead a snowmobile tour for 30 Wounded Warriors from US military troops. I am brand new to the Wounded Warrior program, but I was instantly impressed with the program. So much so that I am going to shamelessly plagiarize from their website to give you, faithful reader, a glimpse of what the program is and what it does for our injured military troops. The Wounded Warrior Project provides programs and services to severely injured service members during the time between active duty and transition to civilian life. Wounded Warrior Project™ (WWP) exists to honor and empower Wounded Warriors who incurred service-connected injuries on or after September 11, 2001. On that date, America watched in horror as approximately 3,000 people died including hundreds of firefighters and rescue workers. The tragic events of Sept. 11 are often the reason warriors say they felt a sense of duty to volunteer for the military. These individuals chose to defend our country, and that is why we honor them. Sept. 11 also served as a catalyst for conflicts Operation Iraqi Freedom (OIF) and Operation Enduring Freedom (OEF). Operation Iraqi Freedom refers to military operations in Iraq that began March 19, 2003 and officially ended August 31, 2010. Operation Enduring Freedom refers to combat operations in Afghanistan and other regions in support of the Global War on Terror. With advancements in battlefield medicine and body armor, an unprecedented percentage of service members are surviving severe wounds or injuries. For every U.S. soldier killed in World Wars I and II, there were 1.7 soldiers wounded. In Operation Iraqi Freedom and Operation Enduring Freedom, for every U.S. soldier killed, seven are wounded. Combined, there have been almost 42,000 injured in the two conflicts – nearly 32,000 injured in Operation Iraqi Freedom and nearly 10,000 in Operation Enduring Freedom. With the mission to honor and empower Wounded Warriors, WWP is the hand extended to encourage warriors as they adjust to their new normal and achieve new triumphs. Offering a variety of programs and services, WWP is equipped to serve warriors with every type of injury – from the physical to the invisible wounds of war. Anyone else out there…struggling with the incredible irony that the universal code for "deceased" ,1144, is also the exact number of Republican delegates needed to secure the Republican Presidential nomination?